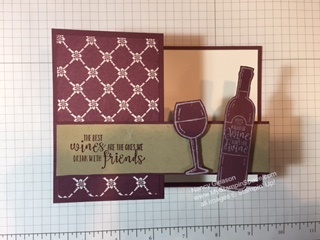 One of the first stamp sets that I just had to have was the “Half Full” wine themed stamp set. It seems so trendy and I knew the ladies in my stamp club would love this set as well! How do you make a Double-Z fold card, you ask? Very easy. I started with a card base of Fresh Fig cardstock cut to 4-1/4″ x 11″ scored at 2-3/4″ and 5-1/2′. The front panel features a decorative paper from the Fresh Florals Designer Paper Stack in Fresh Fig, and Whisper White on the other two panels. The secret to a Double Z-Fold card is scoring the front of the card and folding it back on itself. Another strip of Fresh Fig cardstock, cut to 1-1/2″ x 11″ is also scored at 2-3/4″ and 5-1/2″, and then layered with pieces of Crumb Cake cardstock. Sentiments and images from the set are stamped on these Crumb Cake panels with Fresh Fig ink. 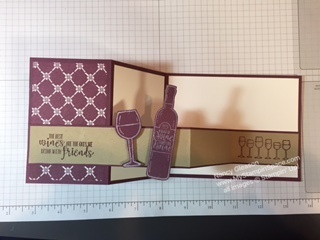 The wine bottle and wine glass are stamped in Whisper White Craft ink onto Fresh Fig cardstock, then fussy cut and adhered to the card front. 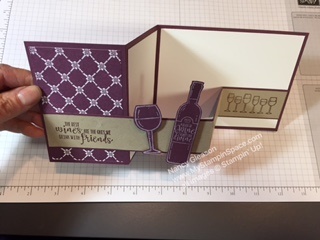 My Paper Snips and Mini Stampin Dimensionals make that an easy task! Easy-peasy! I hope you will try to make a Double Z-fold card. It’s very easy but packs a big punch of “Wow” factor! Leave me a comment and let me know what you think of this project. If you want to order the “Half Full” stamp set, please order from my online store. Remember if you place a qualifying order of $300 or more (gather orders from your friends and family, or host a party with me) and earn the “Merry Patterns” stamp set. Read all the details of the “Merry Patterns” promotion here. Thanks for stopping by, come again on Wednesday as myself and a whole bunch of my Stampin’ Pals will be sharing our favorite Holiday in the Pals Blog Hop; prepare to be ‘wowed’! ← Place Your Holiday Catalog Orders NOW!